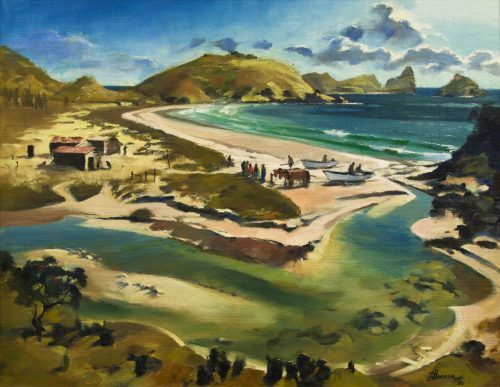 Image Credit: David Barker, Maori Fishermen Matauri Bay, 1960, oil on board, Kelliher Art Trust Collection. Copyright and reproduced courtesy of David Barker. Prizewinning New Zealand Landscape Paintings from the Kelliher Art Award 1956-1977. Join us as we hear more about the collection from the curator of the Kelliher Arts Trust, Christopher Johnstone on Saturday the 9th of March at 2pm- all welcome.